On May 25, 1961, JFK made an astonishing announcement: his goal of putting a man on the moon by the end of the decade. In this engrossing, fast-paced epic, Douglas Brinkley returns to the 1960s to recreate one of the most exciting and ambitious achievements in the history of humankind. 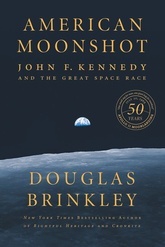 American Moonshot brings together the extraordinary political, cultural, and scientific factors that fueled the birth and development of NASA and the Mercury, Gemini, and Apollo projects, which shot the US to victory in the space race against the Soviet Union. Drawing on new primary source material and major interviews with many of the surviving figures who were key to America's success, Brinkley brings this fascinating history to life as never before.